This week from Bearded we got a slightly confusing new #1 from the new Marvel series for Black Panther which is starting out with a Storyline called the “Intergalactic Empire of Wakanda”. Now I say this is a confusing one because of several things. First they say that Wakanada has been in the universe for 2000 years making their empire in space. What they don’t say is if this takes place in the present day which means that the old tribes of Wakanda somehow made spaceships or got into space somehow or is this somehow a book based in the future? Or is this maybe an alternate universe or something? Second we see freedom fighters it seems that are escaping from the Vibranium mines and being given new names. So we see an M’Baku and at the end we see someone being named T’Challa. So are these the M’Baku and T’Challa we know and love or are these new people, are these alternate universe versions? Are they being given the names because this person knows who they truly are when they don’t because of a mind wipe? No answers are given. It seems the Wakandan’s are in charge of I think it said 5 star systems, and are mining vibranium from the various planets they control. Many things make it sound like this is taking place during present time, but it brings up the questions of why we have not heard of an Empire rom Wakanda before now when it comes to other comics like Guardians of the Galaxy or the Starjammers or something else like that that is galaxy spanning? I mean we all know of the Shi’ar, Kree, Chitauri and Skrull among others. So if these guys are 2k years old why have we not seen them in comics yet. This right now is seeming like it’s going to be a case of what they did with introducing the Sentry into the Avengers where they just go “Oh yeah they’ve always been there” and try to just add this new mythos into what they have already. The problem is it didn’t work well with Sentry, and I don’t think it will work very well with a whole Star Empire. I found this one interesting…I might get more of them just to see if the next few issues answer my questions. If not, then I don’t see me staying with it long. It had some good action but just too many questions popped up for my taste with very few answers. Sometimes this can be good but I don’t think so in a book that’s introducing you to characters and events. Keep the reader asking questions to read more but you can’t have them asking so many questions that they get put off. Sound off below if you have seen this comic and what you think about it! Do you have answers that I may have missed to my questions? Previous Agents of S.H.I.E.L.D. S5F- Is Fitz Really….? Hey Draxis, who wrote this book? Wow. Never saw this one coming. I thought maybe Marvel was capitalizing on the hype from the “Black Panther” film and “Avengers: Infinity War”. Instead, we have a very confusing premise which I think will alienate people looking to read about the T’Challa they know and love (whether it’s comic fans or movie fans). Might be good, but I’ll have to wait on this one to see how it plays out. 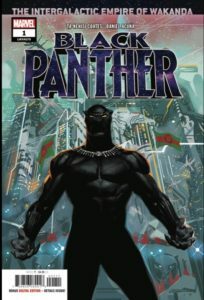 I am quite new to the Black Panther series so I actually found this one refreshing from other comics I have been reading lately. I know it is a bit cliche to say, but the movie really shined a light on the character for me and I became interested in reading the comics. I think as things continue here it will build a lot more. I do have a question, for someone who is quite new to Black Panther, are there any specific graphic novels you would recommend? I want to add one to my collection. I definitely loved how they made Black Panther in the cinematic universe so I would definitely want to read the basis behind it which perhaps is the comics. Although I can see how some parts are a bit different with what they focused on in the movie. I would want to grab a copy on this, would you know how much these kind of stuff would retail Kev? Well it all depends…if your looking for the newer ones then the cover price is usually about $3.99….this one would be in the back issue bins by now so it would either be only a few bucks or maybe a lot more depending on how well it has been received and if its collectible or not (right now back bins for newer are less due to the fact that a lot are still readily available). If you’re looking for the older ones that are ore like the movie then that’s going to be a lot more than cover price most likely as I am sure the BP titles have most likely gone up with how popular the movie has been. This issue was awesome. aguest I start back collecting black panther comics again. After reading this, I say give Ta-Nehisi Coates a Star Wars book to write, possibly set after ROTJ.? Can you review Death or Glory?? If I ever see it I might do such…mainly I tend to review whatever the local comic shops decide to submit to me for review.